Comments Off on What is a Mason? For masons and non-masons alike this New York Masonic Organization has put together a great page explaining what Freemasons aspire to be. How does a man become a Mason? Some men are surprised that no one has ever asked them to become a Mason. They may even feel that the Masons in their town don’t think they are “good enough” to join. But it doesn’t work that way. For hundreds of years, Masons have been forbidden to ask others to join the fraternity. We can talk to friends about Masonry, we can tell them about what Masonry does. We can tell them why we enjoy it. But we can’t ask, much less pressure anyone to join. There’s a good reason for that. It isn’t that we’re trying to be exclusive. But becoming a Mason is a very serious thing. Joining Masonry is making a permanent life commitment to live in certain ways. We’ve listed most of them above — to live with honor and integrity, to be willing to share and care about others, to trust each other, and to place ultimate trust in God. No one should be “talked into” making such a decision. So, when a man decides he wants to be a Mason, he asks a Mason for a petition or application. He fills it out and gives it to the Mason, and that Mason takes it to the local lodge. 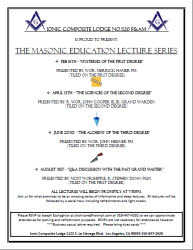 The Master of the lodge will appoint a committee to visit with the man and his family, find out a little about him and why he wants to be a Mason, tell him and his family about Masonry, and answer their questions. The committee reports to the lodge, and the lodge votes on the petition. If the vote is affirmative — and it usually is — the lodge will contact the man to set the date for the Entered Apprentice Degree. When the person has completed all three degrees, he is a Master Mason and a full member of the fraternity. A Mason is a man who has decided that he likes to feel good about himself and others. He cares about the future as well as the past, and does what he can, both alone and with others, to make the future good for everyone. Many men over many generations have answered the question, “What is a Mason?” One of the most eloquent was written by the Reverend Joseph Fort Newton, an internationally honored minister of the first half of the 20th Century. When he can look out over the rivers, the hills, and the far horizon with a profound sense of his own littleness in the vast scheme of things, and yet have faith, hope, and courage which is the root of every virtue. When he knows that down in his heart every man is as noble, as vile, as divine, as diabolic, and as lonely as himself, and seeks to know, to forgive, and to love his fellow man. When he knows how to sympathize with men in their sorrows, yea, even in their sins knowing that each man fights a hard fight against many odds... "
See the complete article at: What Is a Freemason?